Experience this dynamic 90-day journey and satisfy your true hunger. Are you satisfied with your relationship with food? And if not, are you ready to take those first steps toward food freedom? Maybe you question if you're brave enough to face the oppressive power food has over you, or the way it makes you feel about yourself. Maybe you're only beginning to recognize your relationship with food isn't a healthy one. Or maybe you've lost hope that anything can change. Dr. Rhona experienced all of this and more. Because she has lived through and overcome food addiction, she knows too well the struggles in beginning the path to freedom. That's why she has written this active devotional journey--to encourage you to take those first bold steps towards liberation, with God's help. 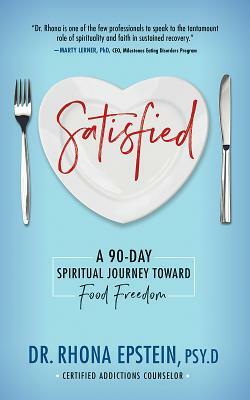 Satisfied is designed for anyone seeking to change the way they relate to food, from those simply looking for healthier food behaviors, to those deeply struggling with food addiction and abuse, the practical time-tested strategies and tools in this book can ensure that food takes it's proper place in your life. Rooted in the 12 Steps of proven recovery programs, and based on Dr. Rhona's experiences in more than 30 years as an addiction recovery counselor, Satisfied pairs scriptural guidance with her counseling expertise. Rhona Epstein, Psy.D., C.A.C., is a licensed psychologist, certified addictions counselor, and marriage and family therapist in the Philadelphia area, and the author of Food Triggers: End Your Cravings, Eat Well, and Live Better. For more than thirty years, she's led seminars, conferences, and therapeutic workshops to help people overcome food addiction and its underlying issues. Dr. Rhona received her doctorate in clinical psychology from Chestnut Hill College and her master's degree in counseling psychology from Temple University. Fueled by her own experience and recovery from food addiction, she is passionate about addressing the needs of the whole person (mind, body, and spirit). Dr. Rhona lives in the Philadelphia, PA, area; Satisfied is her second book.